I don’t know how long I have been waiting for this one, its the official trailer from Marvel released on the Marvel youTube channel. 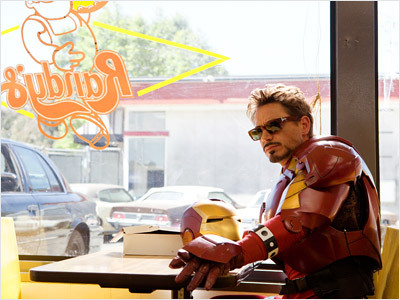 The new Iron Man trailer isn’t as long as the other IM2 trailer we have but is much clearer and looks amazing. it also gives us a little more insight of the movie like how pee’d off Whiplash appears. Director Jon Favreau said the new film will be a little darker but with a play full tone. The whole film just looks amazing so far story and cast wise although you do get the feeling they might have rushed the CGI as it looks a little ropey in parts to me but it may still be a work in progress. The new trailer also has a few clips with Gwyneth Paltrow and Scarlett Johansson looking fantastic in the film along with an angry looking Mickey Rourke as Whiplash, again I can’t see him putting up much of a fight with Iron man but maybe we will pick up some armour or at least a T-shirt at some point in the film. We will probably see another trailer in the new year at some point, the film is due for release on 30th April 2010 and so far no IMAX 3D.